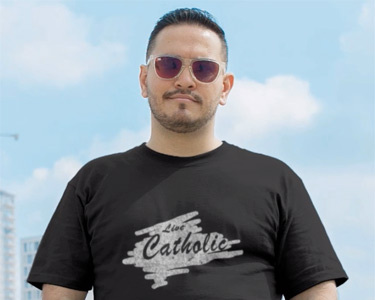 The Catholic spiritual tradition has defined three categories reflecting particular degrees of spiritual advancement. These are 1) The Purgative Way; 2) The Illuminative Way; 3) The Unitive Way. To begin, let’s enlist the help of St. Teresa of Avila and her analogy of a gardener cultivating a garden that the Lord will find pleasing. 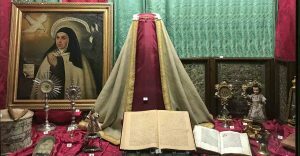 St. Teresa teaches us above all that the goal of the human person is union with Divine Beauty: our loving and wondrous God and Father. It is only in and through and with God that we can attain perfect happiness, human fulfillment and total completion. 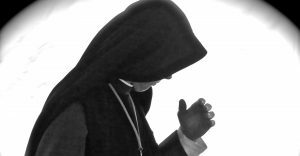 In fact, without God, as she so often emphasizes, we have nothing and are nothing. However, he who has God possesses everything. 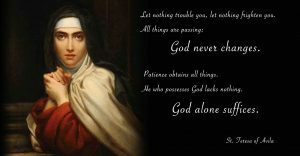 St. Teresa proclaims: God alone suffices!